My girl hated everything Christmas last year, she really didn't care for Father Christmas and cried when it was time to have her photo taken with him. 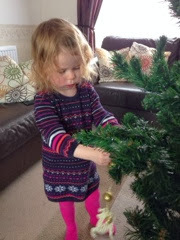 She tried eating all our decorations, so much so that this year I had to buy new ones, ones without teeth marks! This year she already gets that she needs to ask Father Christmas for what she wants (a green T-Rex dinosaur). She even had the audacity to go up to our local Santa in the shopping center (who incidentally only popped out of his workshop for a quick wave and to stretch his legs) to ask for the a fore mentioned Dino. We hadn't paid to see him or have any intention of doing so. I'm excited this year, she can repeat, parrot fashion, that to get presents she needs to be a good girl. I'm hoping it sinks in along the way! Yep I'm aware I sound fairly naive about that. We've also got an elf on the shelf to keep her on the straight and narrow! The bit I wasn't expecting was her observation and subsequent questioning over the fact Father Christmas looks different every time she sees him. I mumbled something about how he probably brushed his hair differently! But this week we are off to our local garden centre to visit his workshop and meet him. Bubba has been primed (by my mum) to ask Santa why he looks different on the tv, in pictures and in person. Can't wait for the answer!